The North Central Arkansas (NCA) Art Gallery features an artist each month. We want you to get better acquainted with our Artists. This month Virginia Potter of Conwayis the feature artist. Virginia Potter is an Arkansas artist, who continues to be inspired by the natural beauty of this state and its people. She developed a rich imagination as a child, visualizing people, events, and places as she listened to stories told by her grandparents. This ability has served her well over a lifetime as an artist. Virginia’s early years were spent on Pryor Mountain, north of Quitman, the area that now overlooks Greer’s Ferry Lake. She has lived in the Conway area for many years and spent some time in southern Michigan allowing her to study and teach art in both areas. She studied art at the University of Central Arkansas, the Arkansas Arts Center, and Michigan’s Flint Institute of Fine Arts. Virginia earned an Associate’s degree in Fine Arts from C.S. Mott College and has attended workshops taught by many fine art instructors, learning skills from each of them. She opened her own studio on Oak Street in Conway in 1973. Not only does Virginia enjoy using different media, primarily oils, acrylics and watercolors, but she also paints a wide variety of subject matter. 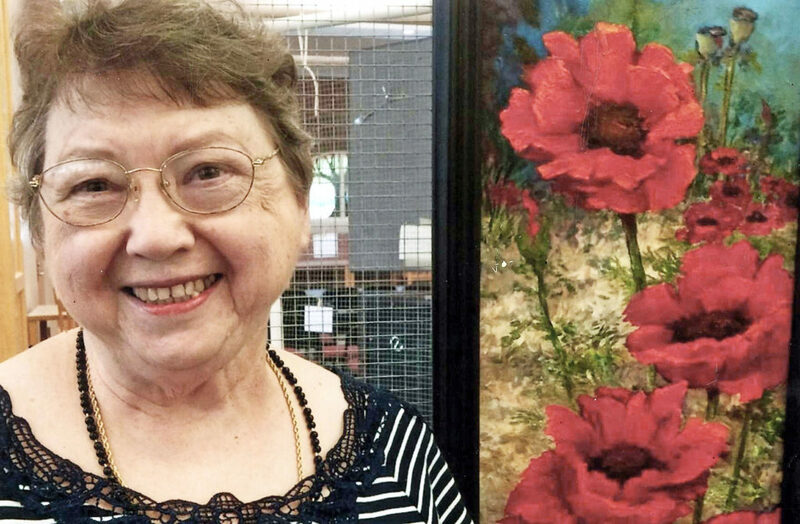 Some of her favorites are Conway city scenes and endangered species of wildlife, but she is generally considered to be a landscape artist. She’s never chosen a favorite medium, but for the last few years she has been intrigued by painting plein-air, which is painting outdoors looking at her subject and attempting to capture the ever-changing light with oil paints. Life takes many turns and the latest in Virginia’s life has been getting married last year to a wonderful, supportive man who encourages her creative lifestyle. They love to travel, enthusiastically loading up the car with painting gear and going to plein-air events or seeking out beautiful scenes on their own across America. But Virginia’s favorite place to paint will always be the beautiful state of Arkansas where she will never run out of perfect scenes to paint. The North Central Arkansas (NCA) Art Gallery Mission is tobring quality Fine Art to our community with good taste & family values.The artists are professionals as well as emerging new artists. The artwork is open to all Artists and chosen by a selection committee under the direction of Art Coordinator, Charlotte Rierson. Art Gallery hours are Tue. – Fri., 9am-4pm(However, when we have conferences, meetings, weddings, events, entertainment, or visitors coming for information about The Bay, the art is available for viewing). The viewing of the Art is open & free of charge to the public. All art is available for purchase. The NCA Art Gallery is sponsored by the North Central Arkansas Foundation for the Arts & Education (NCAF&E) and The City of Fairfield Bay. For more information or purchase of artwork, contact NCA Art Coordinator, Charlotte Rierson – 501-884-6100, email [email protected] or Conference Center Director Wilba Thompson for more information- 501-884-4202, [email protected], 110 Lost Creek Parkway, Fairfield Bay 72088.